In 2013, a group of boating industry executives and their friends launched Boaterz ‘n Bikerz: Hull of a Tour, a 3000-mile cross country motorcycle riding tour with several pre-planned boating adventures staged along the route. 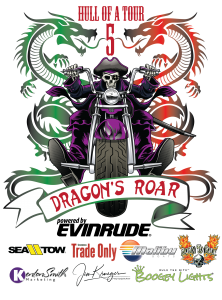 Boaterz n Bikerz: Hull of a Tour 5 returns May 5 to 11 with “The Dragon’s Roar,” a five-day excursion in the Great Smoky Mountains including the Tail of the Dragon. The group will headquarter at the Iron Horse Motorcycle Lodge & Resort in Robbinsville, North Carolina and conduct day rides throughout the tri-state region. Marine industry companies promoting and supporting the tour include: Evinrude/BRP as title sponsor and Soundings Trade Only, Sea Tow and Kenton Smith Marketing. This year’s boating sponsor is Malibu Boats. Additional sponsorships include Jim Krueger Photography, Boogey Lights and Born to Ride motorcycle magazine. Boaterz n Bikerz of America Hull of a Tour is limited to members of the boating industry and their sponsored guests. Group motorcycle riding experience is recommended. Other than a rider’s own expenses and provisions, there is no tour fees to participate. Advance registration is required.